This shop has been compensated by #CollectiveBias , Inc. and its advertiser #LoveDoveFruits . All opinions are mine alone. Have you ever had people over for lunch and ended up with a dessert dilemma? I really struggle with what is acceptable to serve for dessert after a light lunch. Being a food blogger (and a dessert person in general) means that I am usually drawn to serving rich, decadent treats whenever I can and no one has ever really complained. But when lunch is salad, wraps and fruit, it seems a bit much to then serve your guests a piece of chocolate fudge cake afterwards. 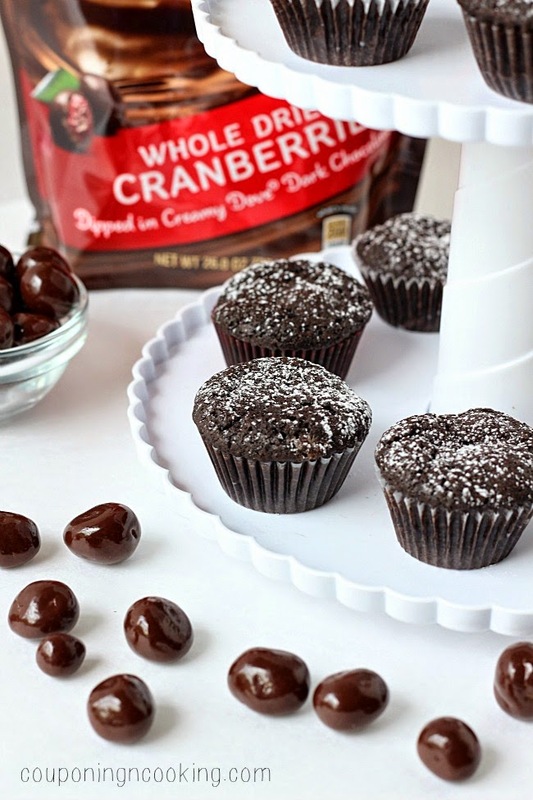 I decided to go with a chocolate and fruit pairing to keep things light and these Dark Chocolate Cranberry Brownie Bites made with Dove® Fruit - Whole Cranberries were the perfect post lunch dessert. I am lucky enough to still be friends with a group of ladies that I grew up with. We went to preschool and grade school and even high school together. Our mothers have always been friends and no matter where our lives have taken us, somehow we have all ended up back in our hometown. This summer since many of us are teachers and a few are nurses with week days off due to their crazy schedules we decided to make an effort to get together for lunch and shopping on a regular basis. Our first few meet ups found us spending way too long sitting at lunch gossiping and way too much money (or at least in our husbands' opinions) on clothes and shoes. After a few such afternoons, my friend Liz came up with the great idea to host lunch at her house so we could save ourselves from the glares of waitresses ready for us to give up our tables and our wallets from the effects of group shopping. Turns out it was a good thing we didn't go to a restaurant because a lunch that started at noon ended at 7pm when one of our husbands called looking for dinner. Turns out after almost 30 years as friends, we still had plenty to talk about. Last week it was my turn to host lunch which is what brought on my above mentioned dessert dilemma. 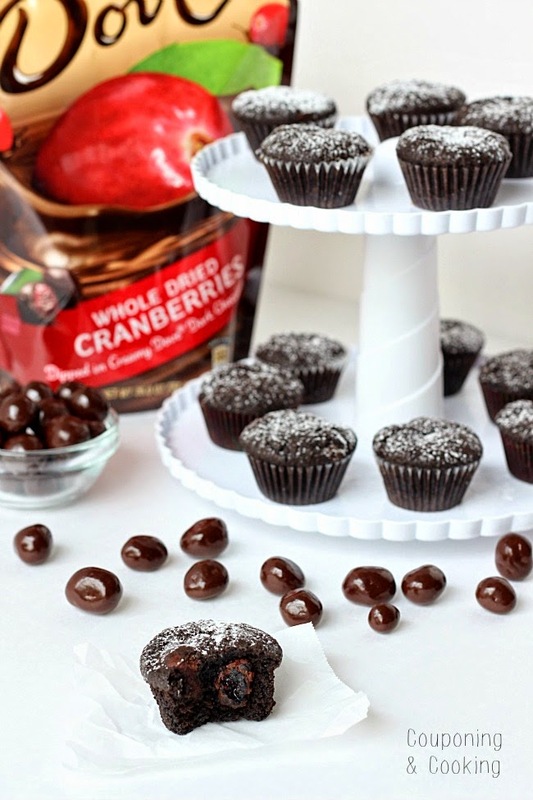 When I saw these Dove® Fruit - Whole Cranberries at Sam's Club I knew I would be using them in some type of dessert recipe to serve the girls. These brownies have to be the easiest scratch brownie recipe ever and the dark chocolate is a great way to get in some antioxidants. 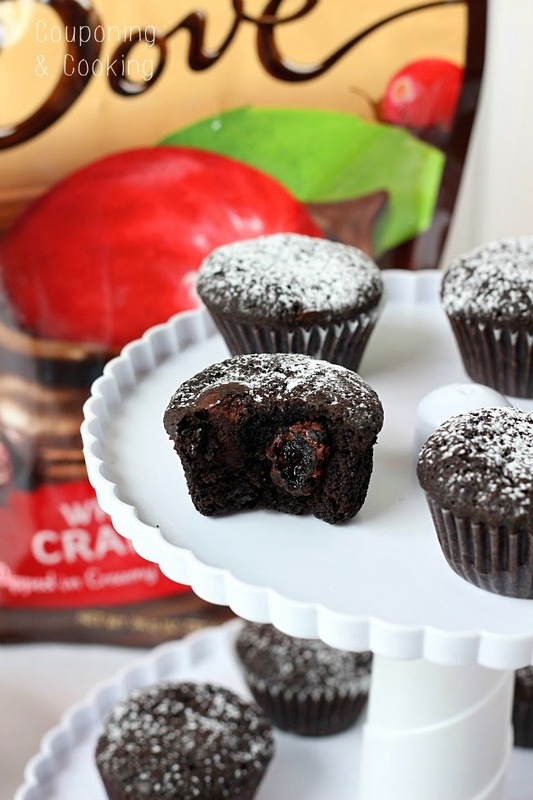 Add in some Dove® Fruit - Whole Cranberries and you have a chewy, sweet and tart way to add some punch to the basic brownie mix. I won't name names but more than one of my girlfriends went back for seconds (and maybe thirds) of these during our post lunch gossip session. Dove® Fruit - Whole Cranberries can be found at Sam's Clubs but they do have limited availability so be sure to visit Sam's Website to check to see if your local store carries them. 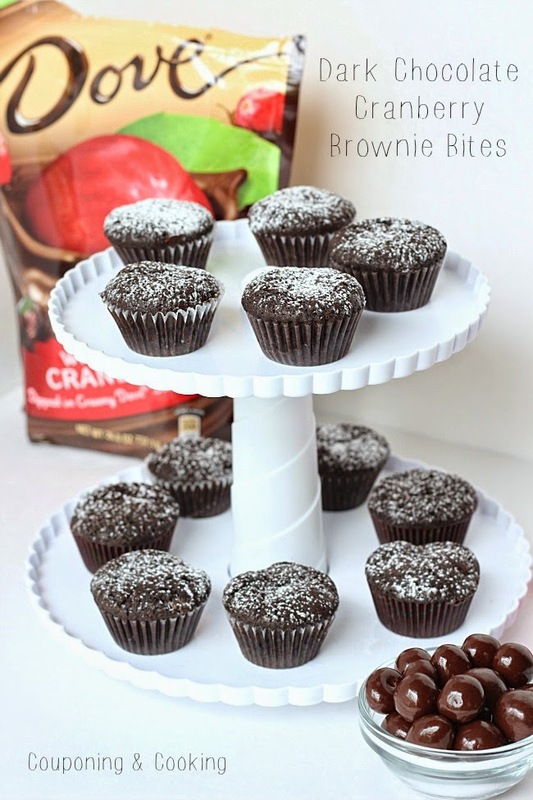 Dove® Fruit is real fruit dipped in dark chocolate so it makes a much better for you snack than grabbing for your standard candy bar and these brownie bites make portion control that much easier too. 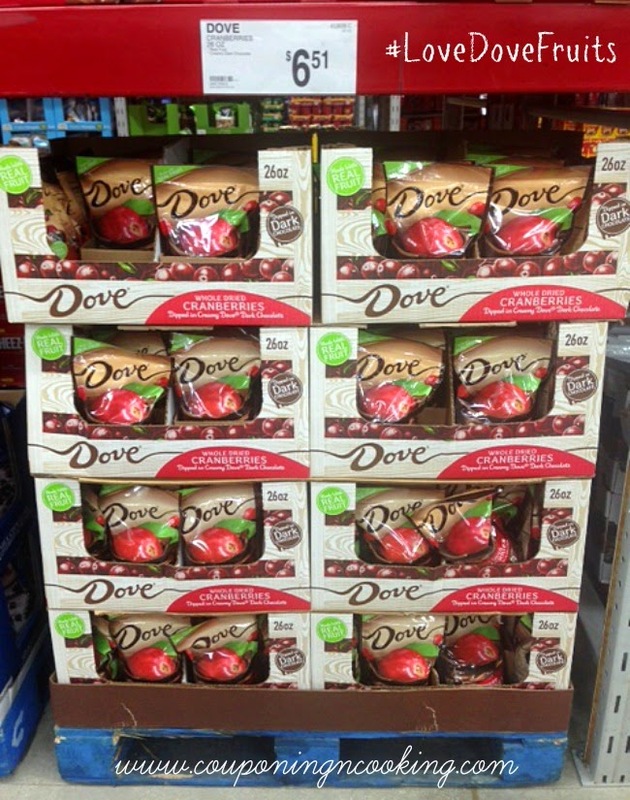 Dove® is also releasing a whole cherry version later this year which will be perfect for the upcoming Fall baking season. 1.) 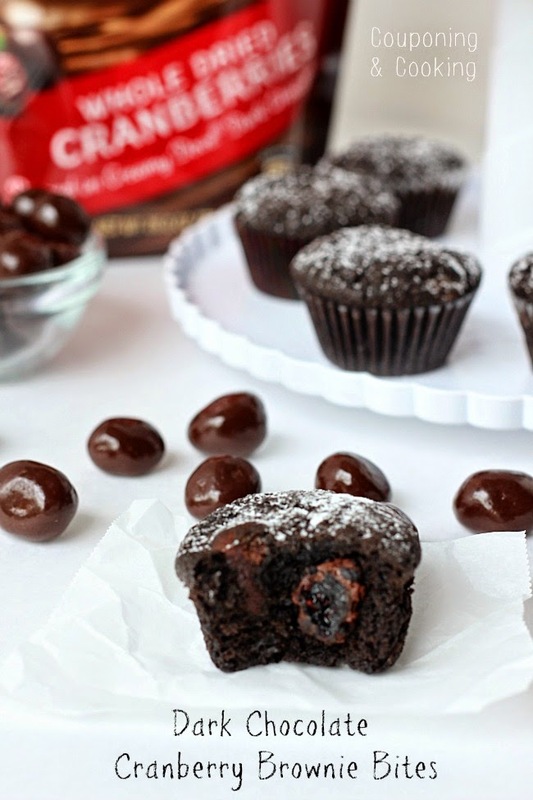 In a large bowl combine sugar, flour and cocoa powder. 2.) Stir in melted butter until completely combined. 3.) Stir in eggs and then fold in Dove® Fruit Whole Cranberries. 4.) 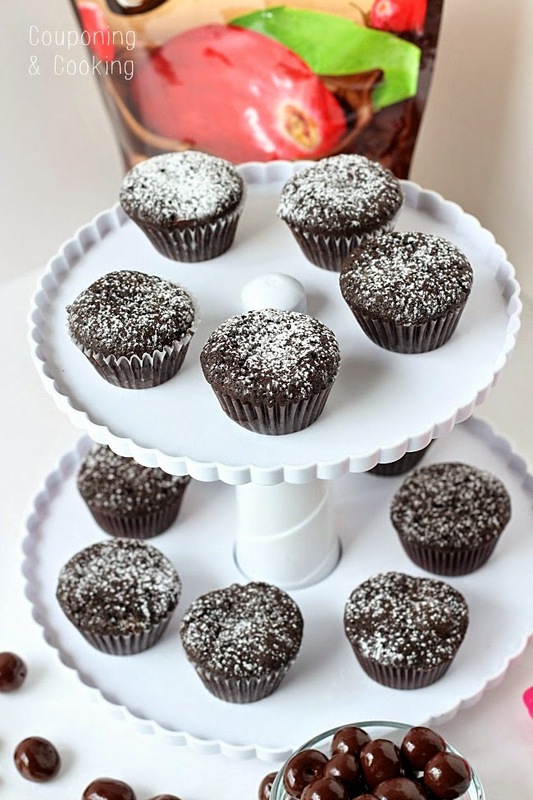 Line a mini cupcake pan and using a tablespoon or small cookie scoop fill each liner with batter. 5.) Bake at 350 degrees for 12-15 minute or until a toothpick comes out clean when inserted. 6.) Dust with powdered sugar and enjoy!